Shirley Wade McLoughlin is a Professor of Education and Affiliate Faculty of Women and Gender Studies at Keene State College in Keene, New Hampshire. Her doctorate in educational leadership was received from Miami University of Ohio. She has worked in higher education for fourteen years. Before entering the field of higher education, she worked in public and private schools, teaching kindergarten, second grade, and music. Prior to her work in education, she worked as a registered nurse, focusing primarily on Maternal Child Health Nursing. Shirley was a 2013 Fulbright Scholar in the Republic of Georgia. Her work at Iacob Gogebashvili Telavi State University in Georgia included teaching Masters and Doctoral Education students courses on educational systems and their development. She also gave seminars to junior and senior English language majors in their Media courses, and presented at a conference for teachers of English in Batumi, Georgia. 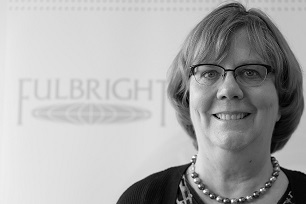 Shirley’s Fulbright work aligned closely with her previous scholarly research, which initially focused on components of race in the United States, and later broadened to examining cultural components of power in differing societies, and the role education plays in this area. Shirley and her husband found the people of Georgia wonderfully welcoming and their culture rich with history and tradition. She has maintained close connections with peers and students in that country, and has contributed articles to biennial conference journals. She will be continuing her connection with the scholars in Georgia, returning in the fall of 2017 to present at the International Scientific Conference on “Intercultural Dialogues” at Iacob Gogebashvili Telavi State University.